First - an announcement! I decided to start sharing my short stories on WattPad! I'll publish my flash fiction here on the blog first. But then I'll share them to WattPad. It's a great place to post and read fiction and I'm really excited to build a platform there! You can follow me by clicking here. Long ago (so like... a few months), I was a part of a thing called Booktube. Basically... people on YouTube who talked about books. I burned out on it a bit and that was when I switched back to blogging, which has been good for me. But, some of my friends host Monthly Recommendations on Goodreads where each month there is a topic and people share their recs for said topic. It's open to people who blog too and I realized the other day... there is literally zero reason why I can't still participate in Monthly Recs here on the blog. This month we're talking about favorite audio books. Which is perfect because I associate audio books with travel and driving, and what better time than summer to be planning what you'll listen to on your next road trip? When I had a longer commute to work, I realized it was a ton of wasted reading time so I started to listen to audio books and podcasts. I loved it! My commute for work these days is much shorter, so I mainly listen to podcasts now because they're faster to get through. But I still download audio books to my phone here and there. It's such a great opportunity to experience a book in a different way. You absolutely don't need to be in the car or on a road trip when listening to books - of course. That's simply my favorite way. Even when I'm road tripping with friends and family, sometimes it's fun to have an audio book to listen to along the way. Once, I listened to an audio book when I had to fly and it was completely delightful because the whole trip I could close my eyes, shut out the world, and listen to my book. I have a lot of friends as new moms love to listen to audio books because it's the easiest way for them to read while taking care of their baby, some people listen while working out, other while doing things around the house, etc. This is one of my favorite books of all time - so it must go at the top of the list. Jim Dale is also the narrator for the Harry Potter books (which, you should listen to those as well if you haven't yet because it brings the books to life n a whole new way!) and he's the absolute perfect person to narrate The Night Circus. It is a book full of magic, romance, mystery, and everything that is beautiful and wonderful in this world. 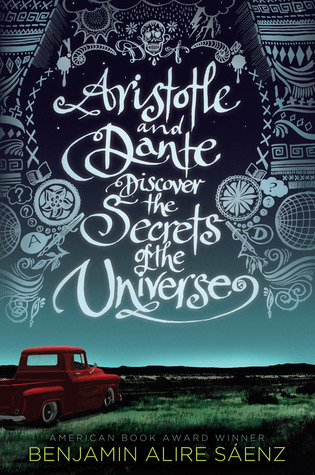 This book follows two magicians who, since childhood, are pitted against one another in a magic competition where a circus which only opens at night is the arena. If there is only one audio book you ever listen to, make it this one. The only hitch is that the narration does go back and forth between years and locations, so be sure you're paying attention at the start of each chapter so you know what year and location you are in. Some of my favorite audio books are memoirs which are narrated by the authors. In fact, I read celebrity memoirs almost exclusively as audio books because I love feeling like I'm sitting down and hanging out with the author as they tell me their life story. I loved Neil Patrick Harris' memoir! It's a bit tricky to listen to because it's set up as a "choose your own adventure book" where you do the "to pick this ending jump ahead to..." sort of thing. Which, this is still an option in the audio book if you aren't driving and have your hands available to skip around to different pages and chapters. However, it still totally works and makes sense if you don't because you can listen to it straight through and hear all of the alternate endings of the chapters. He also has exclusive audio clips in the audio book you can't get in the regular book, so that's pretty awesome as well. This was the book I listened to on an airplane a couple of years back. It was the day after the election and usually I enjoy flying, but that day I just wasn't in the mood for dealing with people. This book was the perfect solution. I loved closing my eyes and letting the narrator take me away with the story. (Also, the subject matter and story was kind of perfect for how I was feeling that day. So, if you were like me a pretty sad that day, this book is for you!) A Madness So Discreet is still one of my favorites by Mindy McGinnis. I wish she would write a sequel so badly! When I first read The Paper Magician series it was via audio book and I was so into the final book, I switched back and forth between the audio and the Kindle version so I could keep reading no matter what. But, switching to the "regular" book was weird after listening to the audio for so long! Not that the "regular" book was bad, it wasn't at all! I think it just shows what a great narrator Amy McFadden was for the series! This trilogy is my favorite of all of Holmberg's books, and I loved the spin-off as well. It's fun, magical, sweet, but also has some dark twsists that I loved! Also, I've heard Disney has picked up these books so... I say get on the train! The first time I read this book, I read it via a "regular" paper back and completely fell in love. It's another one where yes it's young adult, but I firmly believe that even if you don't typically like young adult you'll like this book. It's beautiful, heartfelt, honest, and the characters are some of my favorites. It totally deserves all of the awards it was given! Then... I heard Lin-Manuel Miranda narrated the audio version. Naturally, I checked it out of my library and listened. If Lin-Manuel Miranda doesn't convince you to listen, I don't know what will. I adore Tyler Oakley and love his videos and his podcast. So, when he released a memoir I was all over it. I went back and forth between the hardcover and the audio and both were great! I loved his stories (even if some of them made me feel like a concerned parent and I was like "please be careful and make good and safe life choices...") and getting a deeper insight into his life. Pride and Prejudice is one of my favorite classic novels! I've seen nearly every adaptation roughly a million times. When I saw Audible had a narration by Rosamund Pike (she was Jane in the 2005 movie) I was all over it! I loved how she told the story and really nailed each character! Sometimes it's odd hearing a female voice read a male character, but with her when she did the men's dialogue it wasn't weird at all! There are times when it is hard for me to read classic novels because the writing style is so much different than what authors use today, so audio books can help with that! 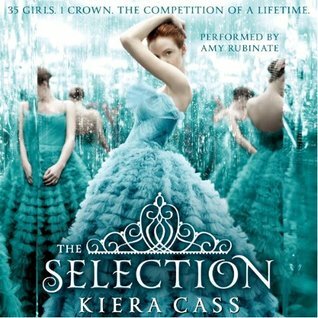 Now, The Selection series, it is completely 100% young adult. If you don't like fluffy YA that takes place in a dystopian America and is basically The Bachelor with royal teenagers filled with love triangles and drama - you can pass on this one. But if that sounds appealing to you, you'll LOVE The Selection. A friend of mine read it a few years ago and told me to read it and to text her all of my reactions because she thought they would be funny. I had so many feelings and reactions to these books, and it was 100% filled with fun. I listened to all three on audio and enjoyed every moment. Do you know what's just as awesome as authors of memoirs reading their own books? Authors reading their own novels as well. Thankfully, Mary Robinette Kowal has a history in puppetry, so she's an amazing audio book narrator! She does the best voices and it feels like she's reading you a bed time story. Shades of Milk and Honey is the first in her Glamourist Histories series, but it doesn't end in a cliffhanger and is it's own complete book so if you don't want to dedicate yourself to a whole series, you'll still enjoy this one. It's basically like reading a Jane Austen book - but with magic! I only listened to the second and third books of this series on audio - but they were fantastic so I'm confident the first book is just as good on audio as it is in print form! I'm not usually a huge fan of mystery and thrillers, and when it comes to detective stories I prefer them as movies or TV shows. These books are one of the exceptions and I simply adore them! They each have their own "flavor" and theme, but the third one so far is my favorite. It was creepy (which I'm usually not a fan of) and exciting. So much so that once I missed my exit coming home from work because I was so engrossed, and once I had to turn it off and wait until I got home to keep going because I was getting so creeped out! (But in a good way.) I need the next book as soon as possible. If you are a fan of Gilmore Girls and/or Parenthood and you haven't listened or read this book yet, why haven't you? 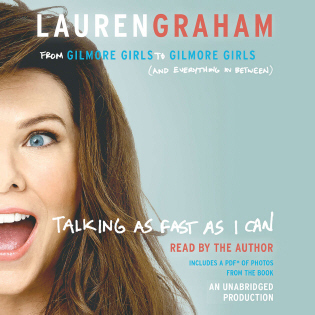 It's wonderful, fun, and I loved hearing more about how Lauren Graham became an actress and her experiences on set. A plus is that it's pretty short. I listened to this on a quick road trip and it was the perfect timing! For my grand finale we have one of the best audio books I have ever listened to! This is another one where if you enjoy paranormal/horror/fantasy/history, but not young adult - don't turn away from this book because it's labeled YA! I think anyone who enjoys these genres will like The Diviners! I listened to this in October for Halloween and it was the perfect pick. It was creepy and mysterious, but so much so that I couldn't sleep at night. Our main character Evie is fun and delightful, and I am in love with this inclusive cast of characters! The narrator does each voice so well, which is difficult because this book has a BIG cast! She also has moments where she has to sing and sometimes with audio books that can feel awkward, but in this one it's completely perfect. I have zero complaints about this book and I can't wait to listen to book 2! There you have it! 12 audio books for you to listen to on your next road trip - or whatever it is you're up to and you want something good to listen to! Do you listen to audio books? What are some of your favorites? Like what you read? Consider buying me a coffee.